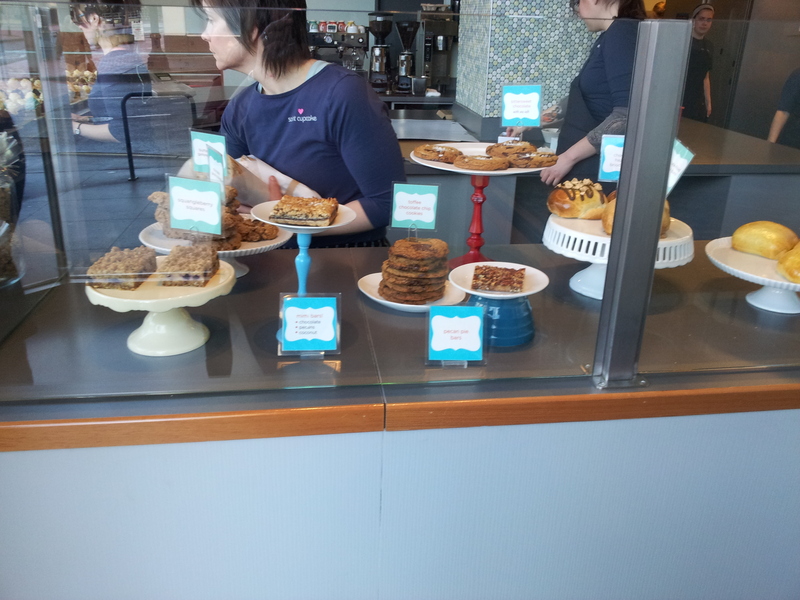 Portland has a ton of bakeries to choose from. 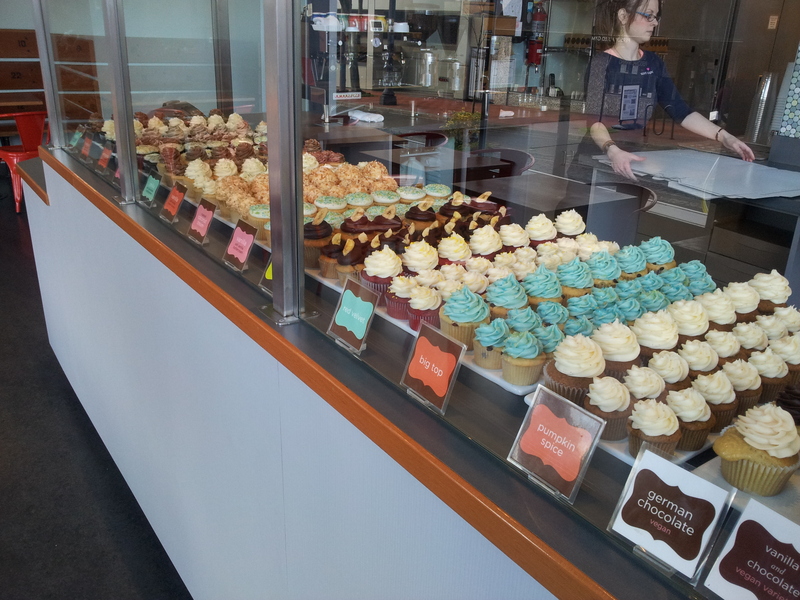 We need a trip with the sole purpose of a bakery tour. 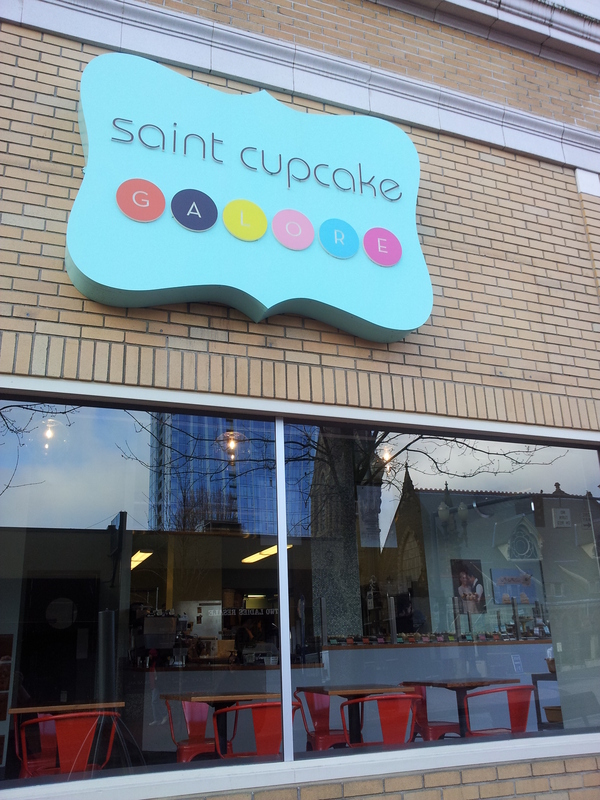 On our concert road trip, we happened upon Saint Cupcake while walking the downtown Portland streets in the morning. The first thing to grab our attention is the awesome whisk art in the front. 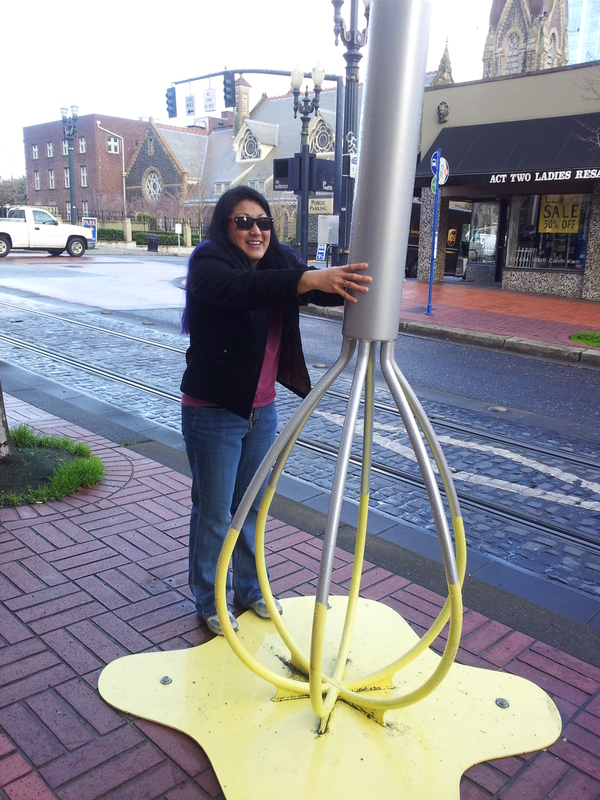 If you’re slow like us (or maybe a little hung over), after wondering why there is a giant whisk on the street, you’ll turn to find a super cute store front. The inside delivers the same kind of cuteness. It looks like something straight out of a Martha Stewart magazine. If the decor isn’t cute enough for you, then the display will put you over the top. I LOVED the fact they didn’t have the traditional curved front cases. 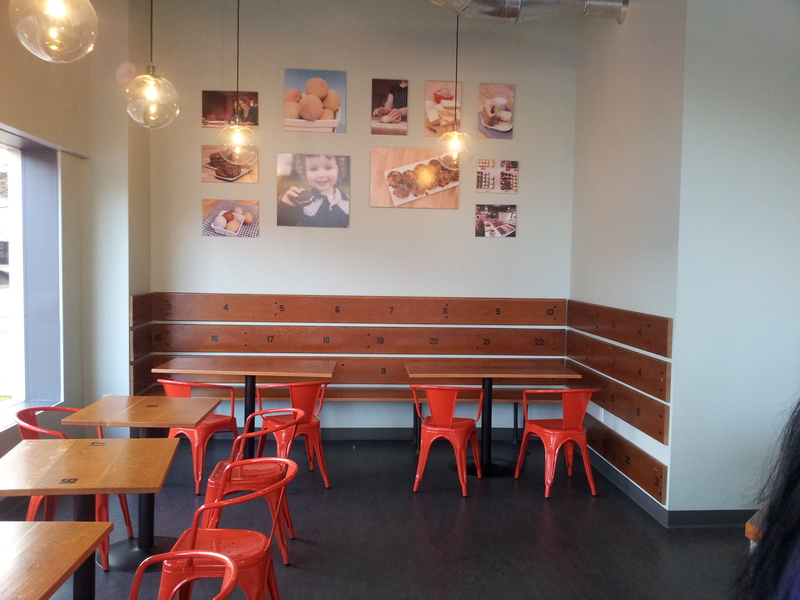 Instead, their uniform displaying of cupcakes kept in line with the contemporary edge of the place. The other side with non cupcake treats was even more adorable. I was most excited about the cake plate creations. Sugarbelle did a fab tutorial on how to make these a few months ago and I was smitten. The eclectic, brightly colored base with a food safe saucer on the top was too much! Now that I’ve gushed over all that is cute, I must tell you what I wasn’t impressed with. The open kitchen concept is not something I like. I guess it’s so you can feel part of the creative process. Years ago when I lived in Long Beach, there was a fabulous bakery where they had a window so you could watch the cake decorator. This view didn’t involve watching the dish washer scrubbing cake pans or the baker elbow deep in mixing a batter. It only had the cool, clean, and fascinating part to watch. But you’re probably wondering most about how it tasted. Let me be fair by saying we did not eat the cupcakes until the next day. But they weren’t anything too impressive. They have a few basic flavor variations (vanilla and chocolate), with a couple creations with interesting names (Fat Elvis and Big Top), and all were fine cupcakes. Would I drive five hours for them? No way. 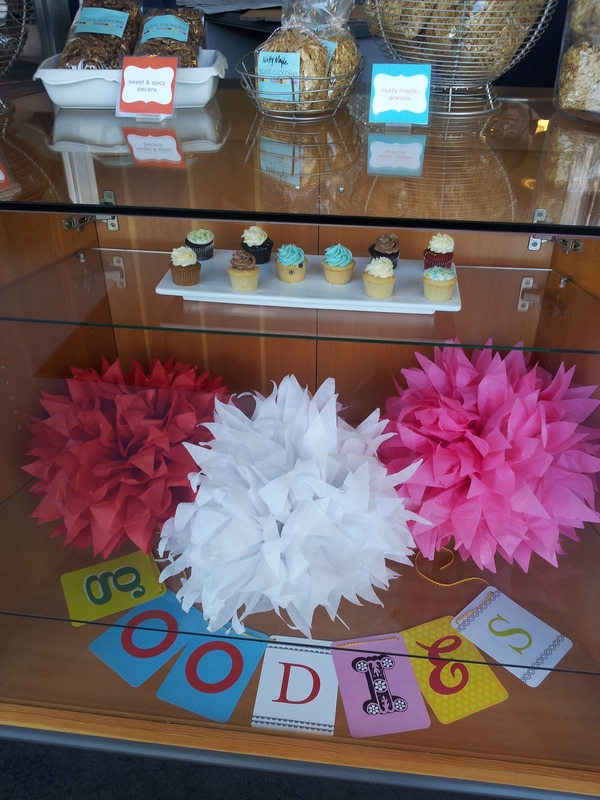 What we did take away from Saint Cupcake were some great ideas for decor. We saw some things we hadn’t seen before, which sparked the imagination and excitement. Unfortunately, I can’t say the same about their baked goods. Thanks for checking it out, Kat. The place was cute.